‘Tis the Season for New Releases! I’m excited to announce the release of new piano books from Spencer Meadow Press: Follow the Star: Christmas Songs for Piano Levels 4 & 5! Follow the Star: Christmas Songs for Piano (Level 4) for the early intermediate student contains arrangements of Deck the Halls, Away in a Manger, Good King Wenceslas, Silent Night, March of the Toy Soldiers (from the Nutcracker Suite) and more! Arrangements are by Donna McFarland, Cherry Wilson and Tami Wilson. Cute black and white illustrations by artist Sandy Silverthorne. 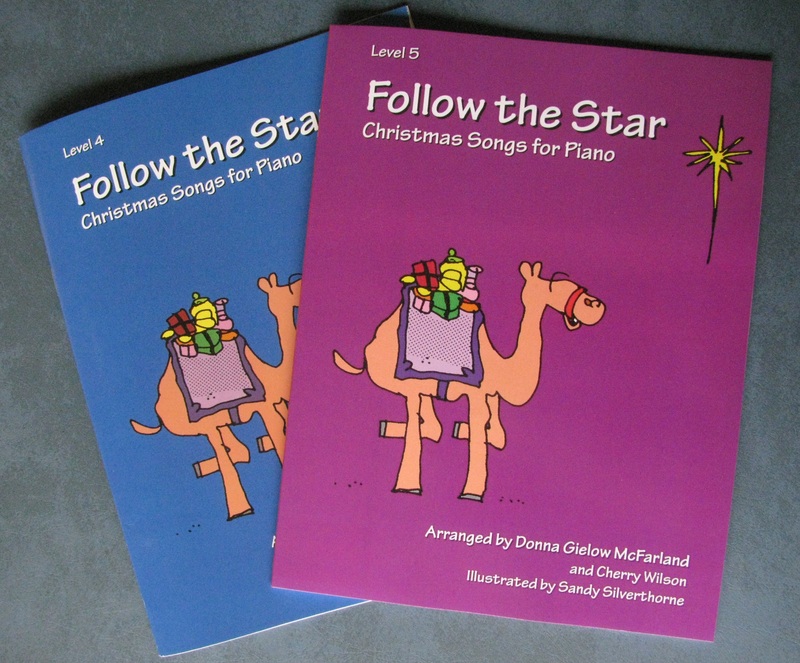 Follow the Star: Christmas Songs for Piano (Level 5) is a collection for the intermediate piano student. Selections include the beautiful Mary, Did You Know?, a Pachelbel’s Canon with a Christmas twist, Russian Dance (from the Nutcracker Suite), O Holy Night, a sing-a-long carol medley, an original carol by composer Gene Skinner and a lively First Five Days of Christmas, which is based on the traditional 12 Days of Christmas. This fresh new version ends with a boogie woogie on Day 5 as the gift recipient pleads for no more birds. Arrangements by Donna McFarland and Cherry Wilson, illustrated by Sandy Silverthorne. Both books are available in print in the new Spencer Meadow Press store. Level 4 is also available on Amazon in print and kindle formats. To celebrate these new releases, the kindle version of Level 4 is available for free download on Amazon today through 10/21/15. Click here to get your free copy!